Sweet village rug made in the Yuntdag district, a mountainous area between Manisa and Bergama in west Turkey, around 1900. Such rugs were made by the so-called yuruks living in these beautiful mountain villages. They were made for domestic use but were also often commissioned by lowland dwellers who were not weavers. 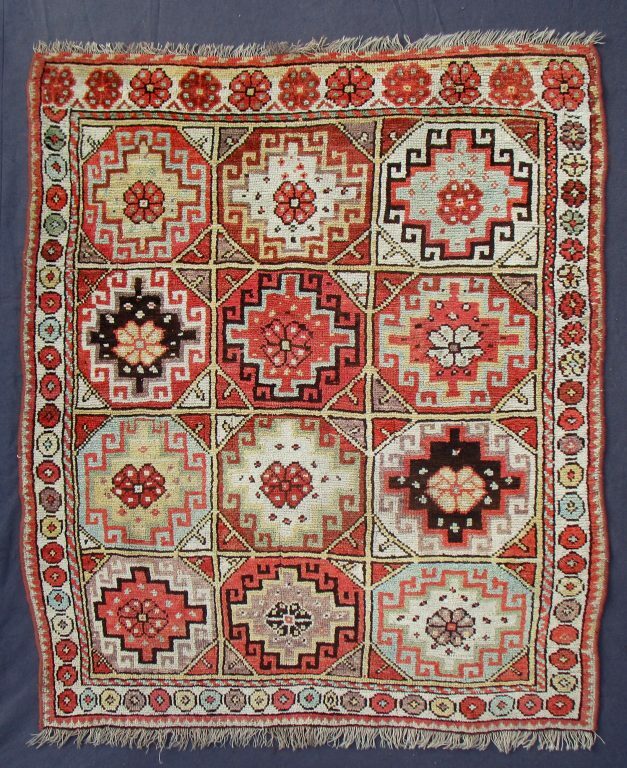 It was a tradition for rugs of this type to be donated to the village mosque on important occasions, i.e. weddings and funerals. Therefore these village mosques are often a wonderful source of local carpet designs stretching back several generations. This area of Turkey was chosen by Harald Boehmer as one of his starting points for his seminal work to reintroduce natural dyes in modern-day carpet weaving. On this small rug of squarish proportions the field is a grid of twelve squares filled with Memling guls, each individual gul different from any of the others. The guls in the left-hand column, in particular, are slightly narrower on the left, which produces an a-symmetry that greatly adds to the charm of this rug. The field is set within a white-ground main border with floral motifs, with an interesting change in the design half way up in the right-hand border, and again in the top end – all idiosynchrasies which enhance the artistic quality of the overall design.